It's been a busy long weekend! Hope everyone had a safe and happy May 2-4 (even though the 24th is tomorrow...) On Saturday, Kari and I headed out to go to Temple, but there was a Bar Mitzvah going on, so we quietly ducked out. I don't mind sitting through them once in a while - especially if I know the child or the family, but in this case, we were packed into a lobby of over a hundred people I didn't recognize, and these things tend to be LONG. So off we went to Wool Tyme instead. I was good! I didn't buy yarn! I bought a few ergonomic Prym crochet hooks (dirt cheap), a tape measure and some beeswax votive candles. Then we had Pho for lunch (YUM) and headed off to Sue's to record the podcast. 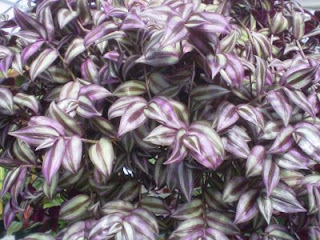 Apparently this is what my teeny tiny Wandering Jew will become! Food - I got ambitious last night and decided to prepare a bento for lunch today. I think a bit more planning will have to go into grocery shopping this week - the pickings were slim :) I made a big pot of quinoa & bulghur with tamarind sauce and a tiny bit of Valentina's thrown in, daikon radish seeds and soy beans. DELISH. I fried up three slices of tofu, cut those into strips, and put that in, with a container of sesame ginger sauce for dipping, added a polish cucumber pickle and some pickled turnip (which I'm discovering I don't like on its own), a little container of longan berries and strawberries, and a peach/passionfruit greek yogurt. Totally awesome. Next time though, I need to make myself a small breakfast bento too so I don't end up noshing on my lunch at 9am. Tomorrow, I may tried some shrimp and broccoli with the quinoa stuff.